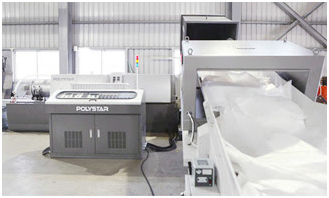 Polystar to demonstrate new recycling machine inTaipei Plas in September 2014 manufacturer,Polystar to demonstrate new recycling machine inTaipei Plas in September 2014 Supplier in Taiwan│Plastic Taiwan. Polystar will be showing its new model "Repro-Flex" in Taipei Plas this September. The re-engineered system is designed specifically for processing packaging film waste of PE, PP (BOPP) with a much higher percentage of printed surface area, enabling producers to process both printed and unprinted film waste efficiently in a single step, with less material degradation while achieving a more stable throughput. * Improved pelletizing system for PP (film/raffia/woven), BOPP and OPP waste. * One stage extruder alone can handle highly printed film -- less material degradation, energy and space saving. * Self adjusting pelletizing speed for higher quality and more uniform sized pellets. * A more compact design with higher output. * Improved filtration and degassing unit can handle highly printed material. * Easy start and operation with setting memorization (human interface control). The much improved degassing, filtration and pelletizing systems result in uniform-sized and high quality pellets for material that is generally difficult to process with die-face cutting, especially printed BOPP film, PP woven/raffia and CPP film waste. In addition to automatic feeding control, the new Polystar system automatically adjusts the pelletizing speed depending on the amount of material being fed into the machine, this results in perfectly uniformed pellets shape and quality despite occasional input inconsistency. The new feature adds more atomization and precision to the pelletizing system and reduces the wearing of knives. The Repro-Flex can process heavily printed PE/PP film in just one single extrusion stage. This replaces the traditional "two stage" mother-baby extruder pelletizer with less material degradation and at the same time consumes less energy and takes up less space. *A continuous filter with two flowing channel reduces operator intervention. In case of higher contamination, a back-flushing filter (optional) is recommend.